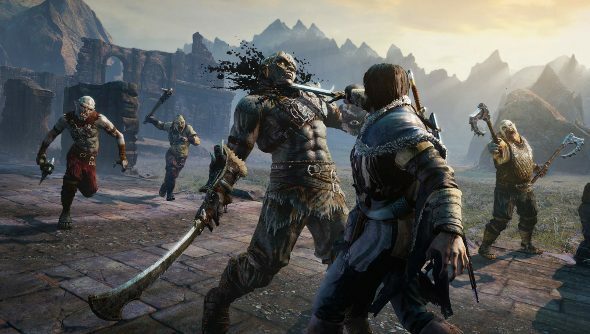 Warner Bros. and Monolith have thrown up a new trailer for Middle-earth: Shadow of Mordor, which is unfortunately going to be competing with Dragon Age: Inquisition when it launches on October 7th. Troy Baker – who voices protagonist Talion and is starting to become as prolific as Nolan North – joins co-writer and director Christian Antamessa for a blether about where the game sits in the story of Middle-earth and what the team is trying to do with the IP. I’m not convinced that an action game about slaughtering orcs that strangely modelled on Gladiator will produce a memorable story or even sit comfortably with the rest of Tolkien’s universe, but I’m very excited to find out anyway. It seems, at the very least, entertaining and action-packed, which probably work better in a video game than hours of elven poetry or drawn-out dinner parties. Antamessa says that it will bridge the gap between The Hobbit and The Lord of the Rings, while also telling a new story. “[T]he challenge was to create something new, but was built on the foundation of Tolkien, and to be respectful of his ideas, while incorporating ours,” the director said. Troy Baker, who played The Joker almost as well as Mark Hamill in Batman: Arkham Origins and was memorable as both Joel in The Last of Us and Booker in BioShock Infinite, explained that there isn’t any fluff in Shadow of Mordor. If anything was deemed superfluous, it was cut. “Everything was incredibly purposeful,” he said. I look forward to attempting to find time to play when it launches on October 7th, making plenty of orc nemeses.